I would venture to guess that you do know what to eat – for the most part – you just don’t trust yourself enough to actually make the necessary changes. This article will show you exactly what to focus on to start eating better and losing weight – without researching diets until you’re blue in the face. Those are the big rocks. Those are where you should spend your time making improvements. Unless you are a competitive athlete or physique model looking to perform a specific feat at a very high level or get down to a very lean body fat percentage, you’ll likely never need to worry about the minutiae. So why do we make it so complicated? Why are you thinking about “going keto” even though you don’t really know what that means aside from your neighbor down the street lost 30 pounds last summer and now sells some kind of product that she swears by? Why have you decided that you’re going to fast every 7th day even though doing so makes you incredibly irritable and miserable to be around? Don’t stress over which one to pick. Just pick one. Inaction is what got you here in the first place so if you want anything to change, you’ve got to take action. Stop searching Pinterest for the perfect healthy recipes. Don’t waste your precious time following foodie Instagram accounts that post smoothie bowls that you’ll never have the time or patience to recreate. Keep them somewhere easily accessible. Cook them (if applicable) however you know how. 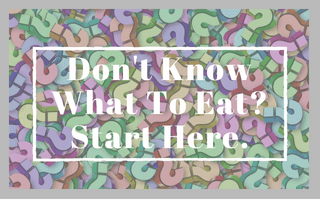 My cooking for dummies article is a good place to start if you’re totally clueless. Check out this veggie recipe round-up to give you some ideas. Season them to make them palatable. Not sure which foods go where? Download a copy of the Body Transformation Guide – complete with handy lists of lean proteins, veggies, fruit, and more. Put it in a bowl on the counter so you’re more likely to grab a piece from there than stick your head in the pantry for something in a box. Prep meals in advance so that you never find yourself starving when you’re out. At the very least, have healthy snacks on hand to tide you over in an emergency. A protein bar in the glove box should do the trick. Do a kitchen clean-out and get temptations out of your house. Stop buying the foods around which you can’t control yourself. Any foods that you do continue buying but might be prone to overeating, should be portioned into single servings (or spring for the pricier-but-already-portioned-out) as soon as you get home. Keep them in a hard-to-reach shelf in a closed cabinet or pantry. Make sure you have plenty of healthier snack foods around like pre-chopped veggies, fruit, yogurt, etc. Most of the above applies here, too. If you’re going to buy caloric drinks like soda or juice, get individual cans instead of jugs so that portion control becomes easier. Consider switching to 0-calorie variations like diet soda instead of regular. Always drink water first and then see if you still really want whatever sugary drink you were craving. Keep a water bottle with you at all times so that you won’t get dehydrated and more susceptible to whatever liquid you can get your hands on. If you don’t like the taste of water, add lemon, lime, fruit, berries, mint, or other herbs. If you’re ok with eating artificial sweeteners, consider Crystal Light or Mio for flavor enhancement. At the coffee shop, get a smaller size, half the syrup, skip the whip, or ask for a lighter milk option. Follow the hand portion guide to estimate appropriate portions. Pre-plate any meals you eat at home and keep leftovers in the kitchen. Switch to a salad or side plate, rather than using a dinner plate – the same amount of food will look like more and might feel more satisfying. Eat slowly, chew, and actually pay attention to when you start to feel satisfied, rather than totally full. Educate yourself on the effect that alcohol is having on your weight loss efforts. Don’t keep booze in the house, if possible. Set a drink limit for yourself. Have a couple of go-to low-calorie drinks that you mostly order to keep the extra calories down. Do a little introspection and think about why you’re drinking. If you’re doing so more than you feel comfortable, consider seeking out professional help. You don’t have to know everything to get started. Stop overthinking it and just take action on whichever of the above are most applicable to you. If you’re not sure which of the Big Rocks apply to you, or feel like they all do equally, take the Food Audit Challenge to give you an accurate look at your weekly intake and help you prioritize changes.